Carlin and Nancy Nalley moved to Lisle in l966 from Kansas where he taught and coached for seven years in Pomona and Council Grove High Schools. Carlin then served Lisle for thirty years in the classroom, athletic arenas, district leadership, and as a community leader. In 1968 Carlin accepted a leadership role as Athletic Director for Lisle schools as well as being the first Director of the newly formed Lisle Park District. Carlin established park programs utilizing a symbiotic relationship between school and park districts, which helped launch park programs for all community members and eliminated any duplication of resources. To his credit, the community saved money while building programs. Numerous honors have been bestowed upon Nalley over the years. Carlin has been named the Suburban Life All Area Football Coach, 1973; Illinois Track Coaches Hall of Fame, 1982; National H.S. Athletic Director of the Year, l984; Illinois H.S. Football Coaches Hall of Fame, 1989; and Honorary Referee for the Illinois High School Association’s State Track Meet, 1997. Carlin Nalley was also a leader in state and national athletic, physical education, and coaching organizations. He served two terms as president of the Illinois Athletic Directors, and served as president of the National High School Athletic Directors in 1986. Carlin’s contributions where honored locally by the renaming of the Lisle Invitational Track Meet to the Carlin Nalley Track and Field Meet. He was also honored at the Lisle Alumni All Years Reunion. When asked about his proudest moment of his career he is quick to mention an honor given to the school system he helped build, the l995 MONEY magazine naming of Lisle School District #202 as one of the top 100 school districts in the nation! Only five Chicago area school systems appeared on this list. In the same year, Lisle schools won the Bright Red Apple Award. Carlin commended the school administrators, staff, Board of Education and the cooperation of the Village, Park District and overall citizens of the community. Carlin retired in l996 from the position of Superintendent of Schools. His wife, Nancy had retired from her Kindergarten teaching position in the Woodridge Dist. #68 the year before. They continue to live in Lisle and stay very involved in their school and church activities as well as attending as many activities that their eight grandchildren are involved in. 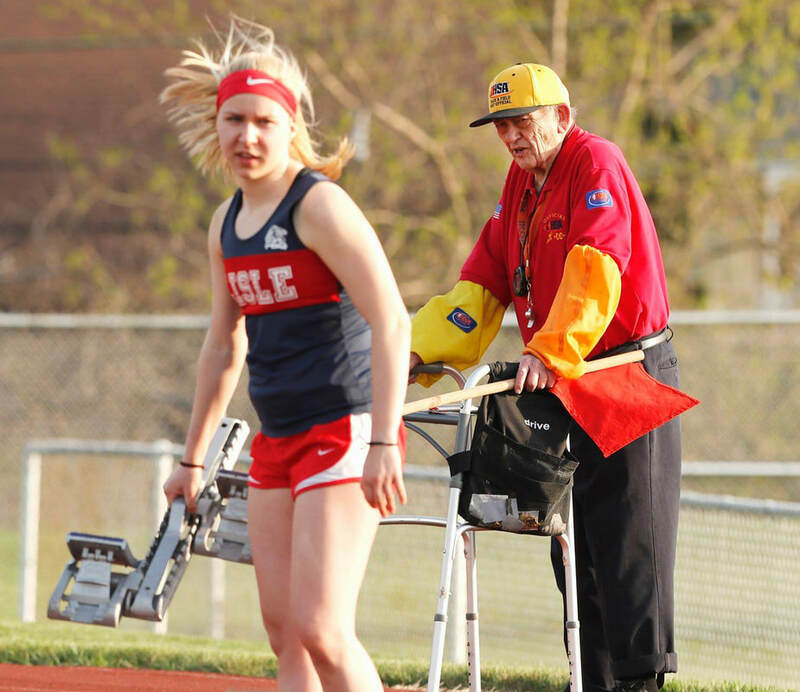 Carlin continues to serve as an IHSA track and field official for many events in the area and assists in some of the current local programs. “True Yesterday, True Today, True in Years to Come. Coach Nalley instructing Steve Woltmann daughter how to place the blocks correctly from his walker on May 2, 2018.